So billionaire Jim Ratcliffe seems to have succeeded in forcing through huge reductions in the pay and conditions of his Grangemouth workforce. See the excellent recent Open Democracy article by Robin McAlpine for the background story. But Ineos, the company of which Ratcliffe is the main owner, represents much that is most destructive and arrogant about modern global capitalism. Ratcliffe’s biggest deal to date was last year’s £5bn purchase of BP’s Innovene petrochemical operation, giving him refineries in Grangemouth, Scotland, as well as Italy, Germany, France, Belgium and Canada. It meant gearing up again but banks lent eagerly. And the deals go on. Currently, he is buying Norsk Hydro’s polymers operations for £450m and paying £150m for the petroleum units of fellow Norwegian company, Borealis. Not every asset in Ineos has been acquired second-hand either: it is building a plant in China that is due to open next year. And the banks who lent to Ineos in a big way included both Lloyds and Royal Bank of Scotland. The very banks that had to be bailed out at vast expense by the UK taxpayer. So the the UK government, via our nationalised banks, is (or was as recently as 2010) among the biggest creditors of Ineos. And these banks failed to act in our interest when they had the chance. Later years’ accounts state that the debt load was $8.7 billion, not $10.7 billion. Still, this leaves a lot of financing costs to recover to keep paying interest to the banks. Someone had to pay the banks their due, while enabling Ratcliffe to maintain his station as a billionaire. Ah yes, the workforce. “Save” taxes means, of course, avoid taxes. Because Ineos owed VAT, it seems, and unlike the rest of us (heavy sarcasm) could not get HMRC to give it a year’s grace to pay up. So Ineos and its owner, Mr Ratcliffe, upped and offed to Switzerland. True to the patriotic tradition of the British financial business elite. Royal Bank of Scotland Group Plc and Lloyds Banking Group Plc, recipients of 66 billion pounds ($99 billion) of taxpayer-funded bailouts, are being asked to endorse plans to move the headquarters of Britain’s biggest closely held company to Switzerland to save on tax. Ineos Group Holdings Plc said two-thirds of its banks must approve the plan, which would save 450 million euros ($615 million) over four years. The chemical maker’s lenders include RBS, 84 percent-owned by the state, and Lloyds, where the U.K. owns 41 percent, as well as Barclays Plc, Bank of America Corp. and Morgan Stanley, data compiled by Bloomberg show. “This is international tax arbitrage and an abuse of tax systems,” said John Christensen, director of the London-based Tax Justice Network…. The Labour government is considering spending cuts and tax increases to close a widening budget gap after the near-collapse of the financial system sparked the worst recession since the 1930s. Taxpayers pumped 45.5 billion pounds into Edinburgh-based RBS, the world’s costliest bank bailout, and London-based Lloyds received about 20.5 billion pounds. Taxpayer funding for Lloyds and RBS equals about 3.8 percent of gross domestic product, Bloomberg data show. Britain’s corporate tax rate is 28 percent, compared with less than 15 percent in some parts of Switzerland, where cantons and municipalities set their own rates. U.K. Financial Investments Ltd., the agency that oversees the government’s stakes in RBS and Lloyds, doesn’t comment on the way “the banks do their business on a day-to-day basis,” said Anthony Silverman, an outside spokesman for the agency. Moving Ineos’s headquarters to Switzerland would affect about 20 jobs, and the company would continue to have offices in Lyndhurst, where it employs about 150 people, Longden said. Ineos, owner of the Grangemouth oil refinery in Scotland, had to renegotiate loan conditions in July after the recession triggered a slump in demand for its products. Moving the company’s headquarters would alter the terms of those loans, so it requires approval of the banks. The lenders were notified about the potential move on March 3, Longden said. They have 15 working days to respond….. The company has about 5.78 billion pounds of loans outstanding, Bloomberg data show. Ineos “remains committed” to the U.K., which accounts for about 30 percent of its revenue, Longden said. The company has about 3,700 employees and 1,000 contractors at eight sites in the U.K. Overall, Ineos has 64 sites in 14 countries and employs 15,500 people, Longden said. INEOS confirmed on Monday that it will move its headquarters from the UK to Switzerland to help make tax savings of around €450m ($616m) over the next four years. The chemical major’s relocation proposal, which was initially announced in early March, has been approved by its lenders, including The Royal Bank of Scotland (RBS) and Lloyds TSB. 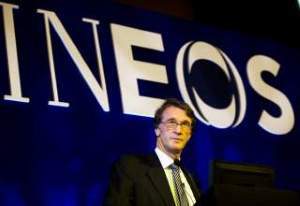 Since the beginning of April, a number of directors – including the group’s founder, Jim Ratcliffe – have resigned from INEOS’s UK holding company, according to documents filed at UK business registrar Companies House. “As part of the process of change, the directors have resigned from the UK holding company and taken up their posts as directors of the Swiss holding company,” INEOS spokesperson Richard Longden said. INEOS said that its day-to-day operations in the UK and elsewhere in the world would be unaffected by the move. Meanwhile, INEOS said it was still in talks with potential investors over the future of its Grangemouth, UK, petrochemical facility. The company has reportedly been looking to sell a stake in the facility in order to ease its debts. “We are in discussions with a number of interested parties about investment in growth opportunities at the Grangemouth refinery, but they are commercially confidential and it would be somewhat premature to speculate on whether any discussions might lead to investment or not,” Longden said. “INEOS has been open that it has been looking for opportunities to strengthen its balance sheet and is looking to improve the company,” he added. For the record, and still according to Forbes, Ratcliffe’s net worth in March 2013 had come down (not clear to us why) to a mere $1,100,000,000 from $2,400,00,000 in 2012. But that still seems some way from penury. We wonder what his pension entitlement is. Perhaps he or the company will now make this public since the costs of the workers’ pensions have been so important to them. The main objective for INEOS is to ‘continue growing in profitability and cash flows’ through leveraging its existing resources to expand sales, cost savings and an increase focus on high and stable margin speciality products. The acquisition of Innovene is said to fit in with INEOS’s strategy to grow its petrochemical business. It is believed that the Innovene acquisition will turn INEOS into a $30bn company and give it the capacity to integrate further and grow more strongly. To enhance current processes and to incorporate the best practices. So Ineos “develops and prepares employees for the future”? Indeed it does. A future of lower pay. And the “best practice” is not to have any pension scheme. Ethical indeed. INEOS has posted a 16% year-on-year increase in earnings before interest, tax, depreciation and amortisation (EBITDA) for the third quarter of 2012 on the back of a stronger North American market, the Switzerland-headquartered petrochemicals company said on Tuesday. INEOS’ net debt stood at €6.3bn as of the end of September, while cash balances and undrawn working capital facilities were €1.2bn and €258m respectively at the end of the quarter, the company said. It’s a sorry tale of amoral debt-financed global capitalism in “race-to-the-bottom” mode – a company that leaves the UK to avoid paying its fair share of taxes, a company built on and fuelled by debt, a company that fails to negotiate with its workforce in any reasonable way – and a company supported financially along the way (it seems) by the British taxpayer, since our state-owned and rescued banks failed to act on our behalf when they had the chance to block the company’s tax-avoiding migration. Posted in: Economy, Industry, Taxation.